Where can I find information about the activities at the resort? A Enjoy all the fun Los Cabos has to offer without leaving the resort. Indulge in a holistic Spa treatment, relax at the three infinity pools, take a culinary tour around the globe or harmonize your senses during an oceanfront yoga class. Kids and teens will have the time of their lives with activities created especially for them. Grand Velas' activities program can be found on the website. 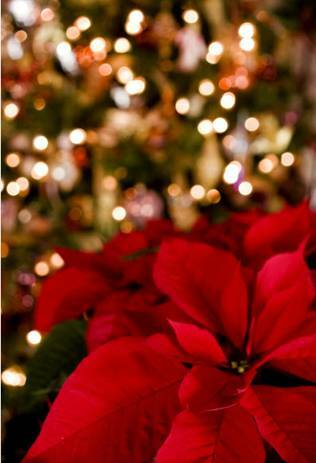 Are there any special evening events during the holiday season? A Grand Velas Los Cabos features many exciting holiday events throughout the year, like colorful fireworks on the 4th of July. The resort also hosts food and wine events, such as the Grand Chef Fest, Mexican fiestas and live music at Cocina de Autor. Visit our blog for the latest updates on events. A Our beachfront Los Cabos resort offers three infinity pools to lounge by and soak up the stunning views. The pools are open daily from 9:00 a.m. to 9:00 p.m. Feel free to unwind with a good book, or sip a cocktail, poolside. The choice is yours. Are all pool areas open to all ages or are there pools for adults only? A All three infinity pools are open to all guests. There is also separate pool for children to splash in. In addition, our all-inclusive resort offers a Kids' and Teens' Club with a fun activities program. What are the ages and hours for the Kids' Club? A The Kids' Club at Grand Velas Los Cabos is open daily from 9:00 a.m. to 11:00 p.m. Kids (ages 4 -12) can enjoy unforgettable experiences at Cabo's most luxurious All-inclusive resort, complimentary during your stay. There is also a babysitting service, avaiable at an additional charge. Do you have a kid's pool? What are the pool hours? A Yes, Grand Velas Los Cabos has a kids' pool for little ones to relax and play. The pool is open from 9:00 a.m. to 9:00 p.m. Please be advised that there is no lifeguard on duty. A Yes, advance reservations for the Spa are strongly recommended to ensure availability. To book one of our holistic Spa treatments or rituals, please call extensions 7401 or 7402, or send an email to reservationspalc@velasresorts.com. Is there a pickup and drop off shuttle for the airport? How much does it cost? A Yes, we offer 24-hour airport shuttle service at an additional charge. Our VIP shuttle service is $300 USD for up to 5 people, roundtrip, from Los Cabos International Airport (SJD). A In order to maintain the pristine tranquility of Grand Velas Los Cabos and remain respectful of other guests, pets are not allowed at our all-inclusive beach resort. Do I need to make reservations for restaurants? A Indulge your senses at our eclectic and global dining options ranging from casual to fine dining at Grand Velas Los Cabos. Advance reservations are required at Lucca, Cocina De Autor, Piaf, and Frida. Book your table now. What is included in the luxury All-Inclusive dining plan at Grand Velas Los Cabos? What restaurants are included in the luxury All-Inclusive plan? Are kids allowed in all restaurants or are any of the restaurants for adults only? A Grand Velas Los Cabos is designed to provide a family experience, with all ages welcome at the restaurants, with two exceptions: Cocina de Autor is for ages 16+, and Piaf welcomes guests ages 12+. Our premium all-inclusive bars are for ages 21+. Can I order food and drinks at the pools? A Yes, we welcome you to enjoy a fresh catch, light fare and tropical poolside beverages daily from 11:00 a.m. to 6:00 p.m. at Cabrilla. Feel free to stop by Amat Café for gourmet coffee, smoothies and sandwiches. Where are the best Los Cabos restaurants outside the resort? A Although our All-inclusive resort collection of casual and fine dining restaurants is impressive, we know that many other culinary delights await you in Los Cabos. For fine dining in town, El Matador and Templo are local favorites with great reviews. For a more casual atmosphere, The Taco Bar and The Office on the Beach offer beachside dining in a lively setting. Nick-San in Cabo San Lucas has the best sushi in the area. How far is Grand Velas Los Cabos from the airport? A Our luxury beach resort is just 24 miles from Los Cabos International Airport (SJD). It is a 20-minute ride by car, taxi or shuttle - a quick drive to utter bliss! How far is San Jose del Cabo from Cabo San Lucas? A San Jose del Cabo is approximately 20 miles northeast of downtown Cabo San Lucas. Feel free to drive or take a taxi to get there. There is also a local bus that runs between the two towns. How much is a taxi from San Jose del Cabo to Cabo San Lucas? A A one-way fare between Cabo San Lucas and San Jose del Cabo is roughly $40 USD, as prices are around $7 USD/mile. Taxis from the Tourist Corridor, are generally easy to find all over town, rates to either town start at around $15 USD and can go as high as $70 USD. Prices cover up to 4 passengers with an additional change per passenger. How do I get to downtown Cabo from the resort? A The Grand Velas Los Cabos is located in the area between Cabo San Lucas and San Jose del Cabo known as the Tourist Corridor. Getting to downtown Cabo San Lucas is a breeze. Just head southwest on Highway 1 (Carretera Transpeninsular No.1), which crosses the entire Baja Peninsula. It is about a 15-minute drive from our All-Inclusive resort. Do I need to rent a car to get around? Where can I rent a car? A Since there are so many amazing places to check out in Los Cabos and the surrounding areas, guests find it easy to rent a car while in town. There are numerous car rental agencies at the San Jose Airport and in town, including Alamo, Avis, Enterprise, BBB Rent-a-Car, Budget, Dollar, Hertz, and National. Our hotel Concierge will be happy to assist you in making any arrangements from our resort. Renting a car in Los Cabos is generally more expensive than in the States, but is probably cheaper than taking a taxi everywhere you go. All drivers must meet the following requirements: a valid driver's license, a credit card and the minimum age is 25. What airlines fly to Cabo San Lucas? A Most major airlines fly in and out of Los Cabos including: Delta Air, American Airlines, Westjet, Southwest Airlines, Jetblue, Alaska Airlines, Air Transat, Porter Airlines and Air Canada. It's best to review each airline's website to learn if your local airport serves as a departing city for Los Cabos. Which airport is the closest to Cabo San Lucas? A Los Cabos International Airport in San Jose del Cabo is the closest airport to Cabo San Lucas. Our luxury beach resort is just 39 km (24 miles) southwest of Los Cabos International Airport (SJD), approximately a 20-minute drive to our hotel on Highway 1. A Yes, both Cabo San Lucas and San Jose del Cabo are safe for tourists to explore and enjoy a peaceful vacation. In fact, there was a recent article in the Forbes Travel Guide that explained that, "'Today, Los Cabos is safer than ever,' said Rodrigo Esponda, managing director of the Los Cabos Tourism Board. 'In the past year alone, the public and private sector have invested close to $50 million to upgrade security infrastructure, equipment and personnel. There has never been such a united and intensified effort to ensure safety'". As you can see, now is the perfect time to visit the beautiful Los Cabos. Are Cabo San Lucas and Los Cabos the same place? A No, Cabo San Lucas and San Jose del Cabo are two cities that together are known as Los Cabos. They do share a coastline, but are 20-minutes apart and offer two different atmospheres. Cabo San Lucas is known for a more vibrant party scene, while San Jose del Cabo tends to be more tranquil. Grand Velas Los Cabos is located right in the middle. What is the weather like in Los Cabos? When is the best time to visit? A Expect sunshine 350 days a year in Cabo due to its desert climate and the Californian Gulf breeze. Winter months average in the mid 70's, while summer months can get just above 100 degrees, so pack accordingly and don't forget floppy hats, sunglasses, and sunblock. Evenings do cool off significantly due to less humidity. The best time to visit Cabo is from May to June after the bird migration, but before the hurricane season. 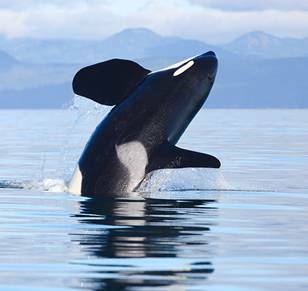 If you're into whale-watching, plan to visit between December and March, and if you wish to go fishing, plan for the late summer or fall. What time zone is Los Cabos in? A Cabo San Lucas, Mexico is located in the Mountain Standard Time (GMT -7) time zone just like Denver, CO. It is one hour ahead of California's Pacific Standard Time, and two hours ahead of New York's Eastern Standard Time Zone. Cabo's Sonoro Gulf Coast Desert climate sees sun year-round. Winter months from December through March average in the mid 70's, while the summer months, June through September, can get just above 100 degrees. Pack accordingly and don't forget floppy hats, sunglasses, and sunblock. Evenings cool off significantly due to less humidity. Hurricane season runs from June through November, with August through October having typically the strongest winds. The spring months, March through May, bring comfortable warm breezes and 80-degree temperatures. What I can do in Los Cabos in December? December is a great time to visit Los Cabos, with beautiful sunny weather, and whales arriving after migrating to the surrounding waters from the Bering Sea and it is also a great time to hit Cabo's world-class beaches, with the warm desert climate providing temps in the mid 70s and 80s. From December through May, Baja is home to eight of the world's eleven whale species, who visit to birth and raise their young. In December, whale watchers can spot up to five different types of whales from Greys to Humpbacks, and sports fisherman can head out along the coast to catch striped and blue marlin. During the holidays, the center of San José del Cabo is decorated with a big lighted tree, and Mexican sweets and holiday treats can be found in the town's charming shops. Get behind the wheel of your own open-wheel tour car and explore Cabo. 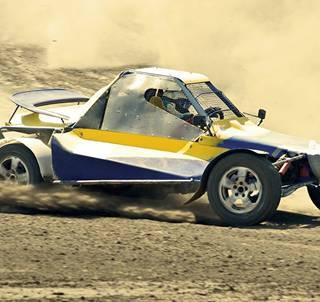 Play at your own pace on the Wide Open dirt track or backroads of the Baja Peninsula. Radio communication keeps you in touch with the tour guide who is there to keep you on track. Find your own way, off the beaten path, or let your guide direct you toward some of the backcountry's best sights. Push the envelope and conquer the elements off-road. Imagine the eco-adventure of a lifetime. Track deep into the heart of the Baja outback onboard Unimog trucks to a hidden destination - Rancho San Cristobal. Enjoy spectacular scenery along the way and savor authentic Mexican cuisine upon arrival. Then it's time to saddle up for the ultimate adventure - a camel ride along a pristine, golden sand beach. Finish your adventure with a fun tequila tasting session, making this the ultimate outback adventure in Cabo San Lucas. Explore all of Cabo from a new perspective. 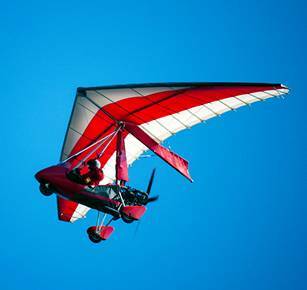 Fly high above the towering granite cliffs and sparkling azure seas in the rear seat of a powered hang glider. Let our experienced, licensed pilot take you on an unforgettable journey to discover the beauty of Baja from the air. With a range of tours, there's an adventure for everybody's thrill level, from short 10 minute hops to a 65 minute flight across all of the Baja peninsula. 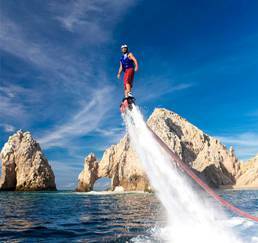 If you crave the adrenaline rush of the coolest adventure sports in Los Cabos, you have to hop on a flyboard. Step into the wakeboard boots and get ready to soar and dive with the warm, clear Cabo waters around you. A personal watercraft provides a continuous water-powered jet to your specially equipped board, and our experienced trainers control your power and height. You do the rest with simple movements of your feet, knees and body weight. You'll be flying through the air and hovering like a pro in no time. Are Los Cabos beaches swimmable? Yes! You can swim in the Los Cabos beaches! With breathtaking beaches at every turn, beach hopping in Los Cabos is the way to go. Some are great for surfing, and for water sports. Due to powerful undertows and treacherous waves, many beaches are not swimmable and therefore are best for just sunbathing. Playa Solmar, Lover's Beach, Divorce Beach, Chileno Beach, and Tequila Cove are among Los Cabo's best swimmable beaches. Make sure to check local weather and be aware of changing sea conditions before jumping in as every beach is different and can vary based on time of day. What family friendly activities can I find in Los Cabos? A Aside from amazing family-friendly activities found right at our resort, there are many attractions nearby perfect for mom, dad, and the kids. Cabo Dolphins and Cabo Submarine are two of the top choices for young children. Surf lessons at High Tide Sea Expeditions or Sea Trek, and Scuba adventures with Cabo Expeditions may appeal to the older kids. Everyone loves Wild Wet Fun Water Park, just north of San José del Cabo. Take a camel ride along the beach, or swim, snorkel and play in the sand at the many local beaches. Can I book activities and excursions at the resort? A Yes, our personalized concierge service is available 24 hours/day for all of your travel needs. They can help you book tours and excursions so you experience all that Los Cabos has to offer. Visit loscabos.grandvelas.com/things-to-do for some local options. What types of wedding venues does the resort offer? A Say "I Do" in paradise, on an oceanfront terrace overlooking the Sea of Cortes, on the golden sun beach, or in an opulent ballroom. Whichever you choose, we offer an exciting collection of personalized wedding packages, providing endless choices with elegant venues that will make your wedding dream come true. What kind of ceremony is included in the wedding collection? A The included ceremony is symbolic. You can choose the right type of officiant for your style and your ceremony: religious, symbolic, or legal. For a legal wedding, an authorized judge will lead your ceremony, and additional services are required to process documentation. Non-denominational ministers lead symbolic ceremonies, and religious weddings are conducted by a spiritual leader such as a priest, pastor, or rabbi. Grand Velas Los Cabos does not have a church or chapel. How do I secure a wedding reception date? A To save the date and reserve space for your dream wedding, a 25% deposit of the total will be required. For more information, you may contact our Wedding Specialist Team at 866-868-0922 (USA & CANADA) and 01800-837-3982 (from MEXICO) or +52-624-104-9800 Ext. 7550 or email to weddingslc@velasresorts.com. How many weddings do you host in a single day at the resort? A Only one; yours. Your wedding is an important event that deserves exclusivity, ​​​​​your personal wedding coordinator will ensure no detail is overlooked. How late can my event go on? A To be respectful to other guests, in outdoor areas, the limit is 10:30 p.m. In our indoor event spaces, the hours may be extended for an additional charge. Please contact us for more details at +52-624-104-9800 Ext. 7550 or email to weddingslc@velasresorts.com. What type of decoration is included in the wedding collection? A Our Wedding Collection Packages include standard décor; round tables, banquet chairs, and table linens to make every event memorable. Our experienced wedding planners will help coordinate every detail to ensure perfection. Can I bring my own service providers? A Velas Resorts has authorized providers who guarantee quality in every event; however, it is possible to work with external providers, with an additional fee of approximately 10% of the total. Do all guests have to stay at the resort? A At least 80% of guests must stay at the resort. Guests not staying at any Velas Resorts must purchase a wedding pass upon their arrival at the resort ($350 USD). Which are guaranteed for purchase only on the ceremony date and guests can stay just the duration of the wedding event. Please contact your wedding sales coordinator for more information. What is the necessary suite block required for a wedding? A In order to obtain a special wedding room block rate, a minimum of 10 suites for 2 nights is required. What is the rate for children? A Ages 0-3 are free; ages 4-16 are half-price and ages 16+ are considered adults. When is the hurricane season in Cabo San Lucas? A Hurricane season in Mexico runs from June 1st to November 30th, with August through October having the strongest winds. But don't let that stop your travel plans, as our All-Inclusive resort has every provision to keep you safe and entertained, however it's rare for Pacific hurricanes to make landfall in Los Cabos. What family-friendly activities can I find in Los Cabos? A Aside from amazing family-friendly activities found right at our resort, there are many attractions nearby perfect for the entire family. Cabo Dolphins and Cabo Submarine are two of the top choices for young children. Surf lessons at High Tide Sea Expeditions or Sea Trek, and Scuba adventures with Cabo Expeditions may appeal to older kids. Everyone loves Wild Wet Fun Water Park, just north of San Jose del Cabo. 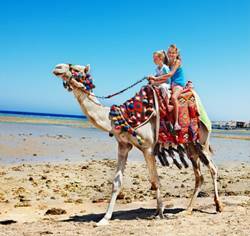 Take a camel ride along the beach or swim, snorkel and play in the sand at the many local beaches. What is the best month to go to Cabo San Lucas? A Los Cabos is warm and dry and averages about 350 sunny days per year. The local motto boasts, "no bad days" and it's true! Los Cabos is a beautiful destination all year round. The "high season" in Los Cabos is from October to July with temperatures ranging between 58°F and 96°F. Los Cabos has a typical rainy season from July to November. If you're looking to catch a glimpse of the migrating humpback whales, December and March are the best times to visit. In Los Cabos, there's truly something for everyone in every season. Do all suites have an ocean view? A Yes, all 307 suites in Grand Velas Los Cabos have ocean views. Does Grand Velas Los Cabos have suites for guests with limited mobility? A Yes, we have spacious, accessible suites so that guests with limited mobility can enjoy a comfortable stay. What is the maximum capacity for the suites? A The Family Suite has maximum capacity for 6 adults or 4 adults and 2 children. What is the check-in and check-out time for the suites? A Check-in is at 3:00 p.m. and the check-out at 12:00 p.m.
What kind of voltage will I find in the suites at Grand Velas Los Cabos? A All suites have 110 KW connections.